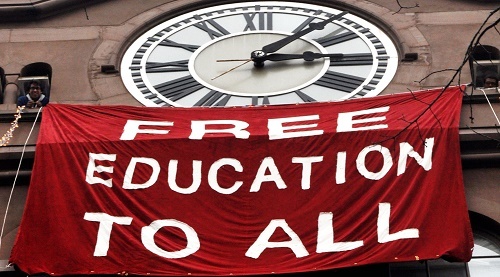 Spurred on by the Labour Party’s recent pledge to deliver three years of free tertiary education (should they be elected in 2017), New Zealand’s student unions are again calling for universal free education. But in praising countries where universal free tertiary education exists, advocates often gloss over what makes free tertiary education possible in the first place – like higher taxes. Or, they ignore the unintended consequences of free education and examples of where the policy has produced poor results. The state of Louisiana introduced free tertiary education in the mid-1990s. It was a policy originally set up with good intentions that is now falling apart at the seams. In 1988, oil tycoon and philanthropist, Patrick F. Taylor, was asked to speak to 183 underachieving inner-city 7th and 8th grade students at a New Orleans middle school. Taylor asked the kids if they wanted to go to college, to which every hand in the room went up. However, most of these children were not expected to stay in school much beyond the 8th grade. The majority of the children in that classroom came from very poor backgrounds; their parents could not afford college tuition and so did not encourage their kids to do well in school. This was fairly consistent with various national reports and surveys conducted in the US during the 1980s, which found more than 80% of American parents did not think they could afford to send their children to college. But, given any opportunity to overcome the financial barrier, many of these children would strive for a college education. And so Taylor conceived an idea, and eventually convinced the Louisiana Legislature to create what became known as the ‘Taylor Plan’. Tertiary education in the US prior to the 1990s was based largely on a student’s ability to pay. The Taylor Plan guaranteed access to college for low and moderate-income students, based purely on their academic achievements. However, in 1997, the Louisiana state government removed income caps. For a programme that was set up with the explicit objective to improve college participation among poorer students, this change marked the beginning of the end of what had begun as a well-intentioned programme. The removal of means-testing meant that all Louisiana students, irrespective of financial need were now eligible for “free” (read: taxpayer funded) tuition at any Louisiana public college, as long as they maintained a C grade-point-average – a low academic threshold. By 2010, around 70% of Louisiana’s high school graduates enrolled in college within the year, a 20% increase on what it was 10 years ago. And, thanks to the generosity of the Taylor Plan, they faced no tuition costs. Norbert Michel here, posts a comprehensive critique of the demise and collapse the Taylor Plan, arguing its implosion was predictable for the very reasons that similar subsidies are destined to fail: free education - at least for some people, like any subsidy, does not lower the costs of products and services, it only lowers the price that some people pay. For any free good or service provided for by the state, the ‘free’ is always misnomer; someone, somewhere along the line has to pay for it. Free tertiary tuition removes the most important customers - the students - entirely from the equation. Instead, it replaces students as the customers with government officials, who care little about the quality of the education provided, and more about ensuring tax dollars continue to stream in. Free tuition, in most examples, leads to a strain on university’s resources; lowering the cost barrier often results in an influx of students, requiring universities to expand their facilities, faculty and staff. Lowering the costs also encourages some students to enrol in university courses when they might be better suited to other vocational training. These are the students least likely to complete a qualification and most likely to drop out of university. In this case the state reaps no real rewards from its education subsidy. The programme in its original form, served a legitimate purpose. It was limited but well-targeted, directed towards encouraging tertiary participation among poor, at-risk students. Under the Taylor Plan it is costs Louisiana taxpayers billions. Ironically, the students who were the intended recipients of the initial scheme are likely now to be hit with a tax hike needed to fund the schemes’ ballooning costs. The programme as it stands today, is a mere shadow of its former structure. But, like New Zealand’s own interest-free student loan scheme, it wins votes, politicians love it, and thus it is unlikely to be abandoned anytime soon. As Michel argues, the best Louisiana residents can hope for is an increase in academic standards required and some form of means-testing. It might not be free, but New Zealand’s student loan scheme is quite generous as is. Why saddle taxpayers with a greater burden, or direct funds away from other activities with an ill-targeted, costly scheme? Louisiana’s experience serves as a warning that universal free tertiary education may just do more harm than good. *Khyaati Acharya is a research assistant at the New Zealand Initiative, which provides a fornightly column for interest.co.nz. Indeed. As (title was different but same job) CFO of a large South Island Polytechnic during the hectic late '80's to late '90's, I saw the effect of many forms of 'student assistance' at first hand, as well as the organisational dynamics which later played out into the 'Cool IT' and other assorted boondoggles. For students, it was a simple case of apply for everything in the hope of snaring some partay funds or buying a car. This has now transmogrified into 'clock it all up at zero interest' which is just as heedless. But, and Interestingly, I have two younger relatives who have looked at the uncertain relationship between loan-funded 'education', the years needed, and the loss of earnings implicit therein, and both decided to flag Uni. A sign of the times, methinks. For the organisation it was an Interesting journey. Most of the show was used to the old Technical High School days where 95% of money was handled offsite by the Gubmint. Think, salaries and property. Thus there was not the faintest notion of unit costs. There was a Magic Money Tree somewhere offsite. After a torrid few years, unit costs were well established, a lot of the old attitudes banished by the simple expedients of firing or retirements, and the attention then turned to the balance between EFTS funding - per student, very broadly banded - and course cost. Pack 'em in, and lower costs was what it inevitably turned into. And the devising of cheap courses with dubious content - the 'twilight surfing' and 'aromatherapy' examples - to attract that input-oriented funding. A Magic Money Tree of a different species. Now that there is Outcome-dependent funding and capped EFTS by course subject area, most of the boondogglery has been squeezed out of the system. Most.....I suspect that there is still a Magic Money Tree mentality, if only amongst students. And the whole business model is being eaten alive by MOOC's and private provision. E.g. no-one in IT gets their working qualifications mainly from state-subsidised providers: it's mostly user-pays-100% (at Microsoft, Cisco, IBM, Oracle etc.) for the qualifications which actually count. Biased article. Your point about it not being free is made ad nauseum. You then point out the negatives: as I see it from your article these are: 1. Higher taxes; 2. A 20% increase in enrolments; 3. Your inference that the quality of the education declines; 4. Expansion of universities' facilities; 5. Incentivising students towards university as opposed to other vocational training. Yet I didn't hear of any of the benefits of providing free education in your article. Why? Are there simply none? I don't think so. You also infer that for the above reasons, the scheme failed. But why EXACTLY did it fail? Was there just a new government that lowered taxes and scrapped it? I'll never know based on your article; I guess I am supposed to just think that it failed because free education is bad. To act as your opponent and hopefully give this article less bias, let me debate your points. 1. Okay potentially higher taxes depending on how you draw up the budget, but let's assume no other changes so there needs to be higher taxes. This is the cost, but what are the benefits? A more educated workforce. Removing the financial barrier to higher education. Remember students fail even if they pay (read their parents pay) tuition as well, not just those who don't pay. This is also a loss of resources to the economy. 2. More enrolments. Not sure why this is bad and how it leads to failure of the program. This is what would be intended by a free education program. 3. I disagree that quality of education declines. You say that it takes the student out of the equation. Why do you think people go to university? Whether or not you pay for it, you still choose quality. And if it is true what you say, I am sure that this is a separate issue that can be addressed within a free education program. 4. Expansion of facilities. Again as with number 2, I would think that this would be the intention, so not sure how this is bad, as long as there is some long-term funding certainty for education providers. 5. We can include other vocational training institutions in a free education program so as to eliminate this problem. Really I think the argument just boils down to issue number 1. All the rest is rubbish. You either see value to the community and economy in providing free education to justify the expense to taxpayers, or you don't. Personally I think there is a middle ground to be reached here, to give students some personal responsibility. But that middle ground is not going to be reached with articles like this. I agree the article is highly flawed. Give free education where there are shortages of skilled labour. Then there's no waste. Student loans just lead to higher and higher tuition costs. The costs are out of control and the educational institutions will keep increasing fees. This just creates a lot of student debt leaving people at a huge disadvantage when they start working. Free education where it's needed and if someone wants to do a Ph.D in underwater basket weaving they can get a student loan for it. All while knowing there are free and productive options. As I read it, your article is portraying an attitude where you can only access tertiary education if mummy and daddy are wealthy enough. That may suit the view of the world that you have grown up with, but I prefer to think that NZ aspires to a society in which people are given every opportunity to achieve their full potential. That is fair for everyone and should produce a society that is better off as a whole. People who, for whatever reason, are limited in how much they can achieve and contribute, diminish the level of the nation's potential success. Is the Norbit Mitchell the Norbert Michel from the Heritage Foundation? This is a worrying trend in New Zealand. Ideas that we think are 'real'' thought through ideas' may simply be paid comment to promote an ultra right wing agenda. Again? What about the countries in the world (you know there is a world outside the anglosaxon world?) where education is free and works fairly well? France, Germany, Sweden, even Italy has excellence in education. And middle class taxes in NZ are higher than in those countries. And yet, the only example given is ... a single scheme in Louisiana. Give me strength. One can't help wondering whether these on-going articles against free education are at least in part motivated by - 'I had to pay for my education and it wouldn't be fair if others didn't'. Perhaps this author might like to invest her time researching the comparative value to NZ Inc. of paying NZ Super to those earning over say $60 - 70,000 p.a. versus funding tertiary education. A cessation limit of $70,000 would save enough to fund roughly half the tertiary education cost of $1.2b. I'm for free tertiary education. But you also have to recognise that one of the hallmarks of third world countries these days is large numbers of unemployed university graduates. We have been sold the story that increased education is the way forward, but that has had the result of large numbers of people with degrees are chasing the same jobs that once were filled by quite adequately by people without degrees. And there is also a lot of very poor tertiary education. Courses padded out. That take three times as long to do as is really necessary. Despite their self righteous stance, there is no sector like the education industry that responds wildly to a cash carrot. Example: the 'bums of seats' fiasco. Then. We have skill shortages in industries like building. That's weird. I would suggest we have free university education, with severely limited places, with admission on merit only. Maybe only 20% of the places we have now At the same time we offer (free and on merit) other training in a range of desirable occupations. Building, engineering, hospitality (this actually is also 'tertiary'). Most of all we need to have high expectations of any institution that it's perform. No more farming the kids. Free tertiary would, like Germany, lessen the pressure for universities to aim for bums on seats. They can be bulk funded based on rough size. Quality control is also possibly more feasible without fee barriers. Will the next step by the National Govt be turning All High Schools into fee-paying institutions? I mean all those 13 -18 year old students and families are currently enjoying free tax-payer subsidised education which achievers can exploit for a good university start or a job. This is the ongoing philosophy of Neo-liberal, multinational corporate-supporting Governments - get the Govt out of every public institution.